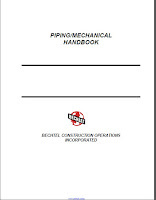 The specification, design and use of PE piping systems is addressed by a number of standard specifications, standard test methods and codes including those issued by ASTM International (ASTM), American Water Works Association (AWWA), and Canadian Standards Association (CSA) as well as Technical Reports (TR’s) and Technical Notes (TN’s) published by the Plastics Pipe Institute (PPI). A listing of the more frequently referenced standards, reports and recommendations is presented in the Appendix to this Chapter. 1. Material specifications relating to properties and classifications of PE materials for piping applications. 2. Standard requirements relating to pipe pressure rating, dimensions, fittings and joints. 3. 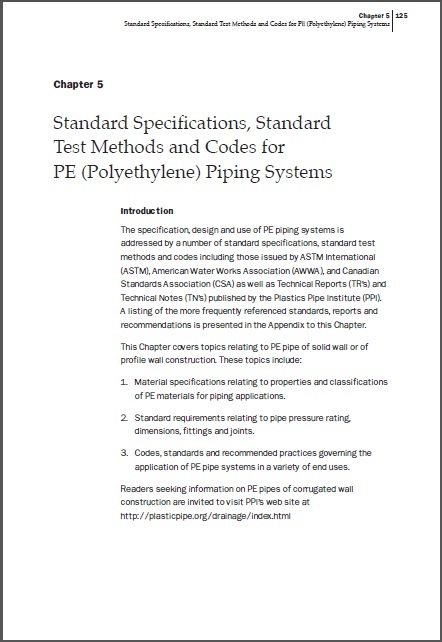 Codes, standards and recommended practices governing the application of PE pipe systems in a variety of end uses.